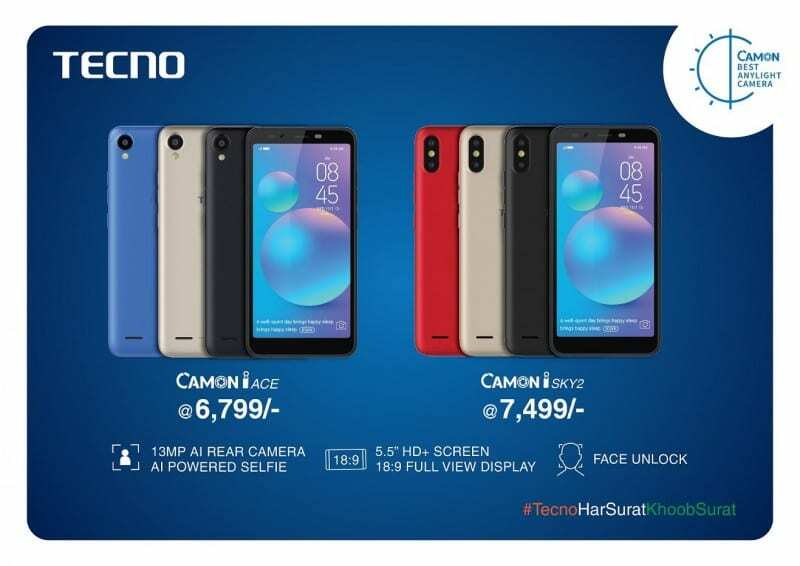 Tecno, a smartphone brand of Transsion Holdings has unveiled two new budget smartphones in their Camera-centric “Camon” portfolio. Previously, the company had announced Camon i and the iSky. Today, the company has announced the Tecno Camon iACE and Camon iSky 2. These smartphones sport a 5.5-inch 18:9 HD+ display, they are powered by a Quad-Core MediaTek MT6739 processor clocked at 1.5GHz and they are paired with 2GB RAM and 16GB internal storage along with microSD card support up to 128GB. These run on a custom skin dubbed as HiOS based on the Android 8.1 Oreo and are packed with a 3050mAh battery. Tecno Camon iACE is priced at INR 6,799 and the Camon iSky 2 is priced at INR 7,499. The sale of iACE starts today and will be available across India through 35,000+ retail outlets. and the iSKY 2 will be available from August 20. Jio customers to get INR 2200 cashback (44* INR 50 vouchers) at the time of 1st successful recharge of INR 198/299 monthly plans. The offer can be redeemed from the 2nd recharge onwards.